When it's not freezing cold for a week, the weather has been lovely. I'm always glad when it is not freezing cold! Any day the mercury doesn't hit 100 is a GREAT day! I'm sure the U.S.P.S. has some mighty fine folks working for them, but when all's said and done ... they're no friend of mine! What do you hear from Darian? Or 30*! Darian is busy learning the Army and the Army ways. Making friends! And he has a girlfriend. I hear from him when I contact him. Who has time for a granny?? LOL! I had to send a certified letter recently and it cost $6.00 just to do that. Actually only required a few extra pieces of paper to be filled out and for the postman to knock on the door or ring the bell and get a signature. USPS sure has changed over the years! Glad you are getting some nice fall weather :) This year has flown; can't believe we are entering October in a few days! I echo what Myra wrote. How is Darian doing? I don't know about 'wonderful' but it had to be done. We are into autumn here too! Summer is my favorite too but there are many wonderful things to enjoy in the fall. Postage is expensive. Since I have family out of town, I mail packages to them and sometimes the postage costs more than the gift itself. New drivers do need experience no matter how good they are. I'm glad you are insisting on that. Hope you have a wonderful weekend! Before we know it Fall will be a thing of the past too. Sounds about right. Same with Harley's dress. We have gotten enough rain for now. Ready for sunshine!! I like fall the best because it's not as humid and summer. Mailing a package is expensive. I used to join a blog hop on my old blog where we used this same format, but don't remember the name. 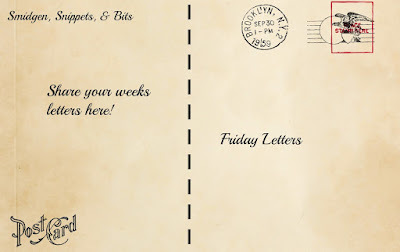 I think that may have been how I got the idea for my Friday Letters. But I don't remember the blog either. I guess the lesson learned from the dress would be to only buy from sites that cover return postage. And yes if you paid for 5 hours you must get 5 hours. Hope your weekend goes well. What does he mean she's so good she doesn't need 5 hrs. I would report him...the slacker. I've become very careful about ordering clothes. I usually only order from places that pay return postage or buy things that I can try on. It seems to cost me less overall. Beautiful day in New York and finally fall is here! I will start to look at that too Carol! Hope you've had a relaxing Sunday. It's been cool enough here that I didn't need to add ice to my drinking water. Yikes! I hope Harley gets all of her hours behind the wheel. With you on duty! I'm she she will. Good job! Postage isn't bad when the package is under a pound. But over that pound, the price goes way up. I got surprised by that last year. Eeek. Now we know why Amazon is doing a return thing via Kohl's and Whole Foods. They're starting a pilot program where you can bring your returns there. I bet that's going to be a big hit. This dress was .8 oz over a pound. Crazy! I like the idea that Amazon is creating.